Forget about the FANGs, it all about the FAAMG stocks. Most traders & investors are familiar with the term the ‘FANG’ stocks, an acronym for the high-performing tech stocks Facebook, Amazon, Netflix and Google. Why Netflix, with a market cap of only $60.15B is included instead of the much larger Microsoft (MSFT), which not only has a market cap over over 8x that of NFLX (502.6B) but is also one of the best performing & top-heavy components of the leading index, the Nasdaq 100 as well as one of the top components of the S%P 500 Index? I guess the word ‘FANGs’ has a cool ring to it when spewed out by the financial media or something along those lines. The chart below shows the Nasdaq Composite plotted above the percent of stocks within the Nasdaq Comp trading above their 50-day moving average. 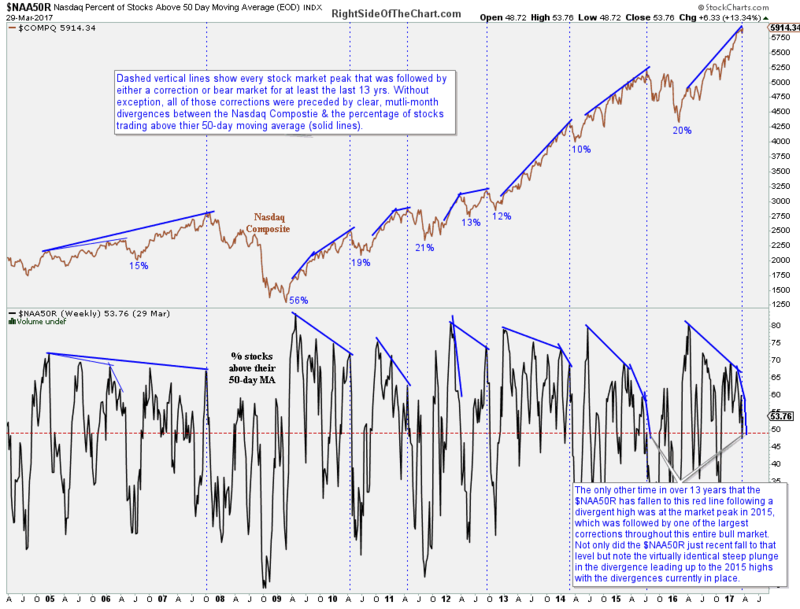 The dashed vertical lines show every stock market peak for at least the last 13-years. 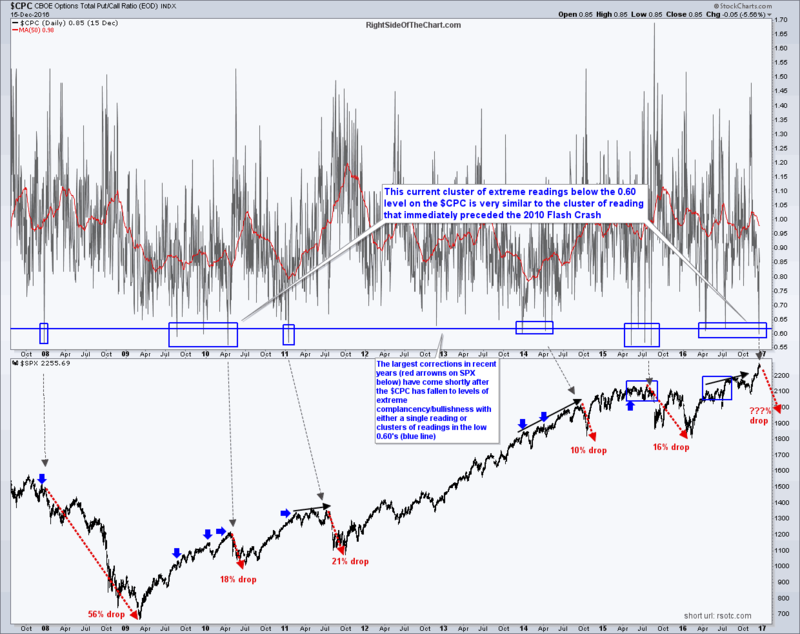 Without a single exception, all of those corrections (a drop of 10% or more) and bear markets (20%+ drops) were preceded by clear, multi-month divergences between the Nasdaq Comp & the percentage of stocks trading above their 50-day moving average. Of particular note is the recent plunge in the $NAA50R which virtually mirrors the plunge that preceded the market top in 2015 which was followed by one of the largest corrections throughout current 8+ year bull market. 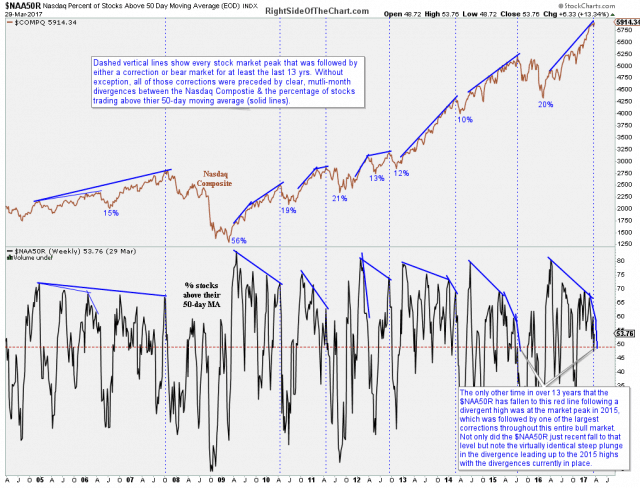 One of my favorite indicators for identifying potential corrections in the stock market has just triggered the 4th extreme reading of below 0.60 on the Put-to-Call Ratio in what I refer to as a cluster of readings (a series of sub 0.60 readings that occur in relative close proximity without a substantial correction while the stock market is moving higher with each successive reading). So far today, both GLD (Gold ETF) & GDX (Gold Miners ETF) gapped down & continued lower but have since recouped all of their post-opening losses & then some while the equity markets gapped up, rallied from there but topped out shortly after & have since been moving lower… essentially a near inverse mirror between the price action in the PMs & equities so far today. Should the current trends (stocks moving lower while gold & GDX rally) continue into the close today, that would indicate distribution in equities (sellers stepping in to sell the rallies) in equities & accumulation (buyers stepping in to buy the dips) in precious metals. Short sellers are often vilified by the mainstream media, CEO’s of publicly traded companies & many institutional money managers which are forced, by prospectus or other security selection parameters, to maintain only long-side exposure to the market. I won’t go into all the benefits that short sellers provide, such as liquidity and sniffing out corporate malfeasance while the masses are content to turn a blind eye as long as a stock is in a bull trend, other than to mention that short sellers, at least when short interest is at normal or above average levels, often serve as a backstop in a stock or the broad market during selloffs as short sellers are the only guaranteed buyers in the market. On the chart below, I plotted the month-end values of the S&P 500 against the Domestic (U.S.) Long-term Equity-Only Mutual Fund Flows. 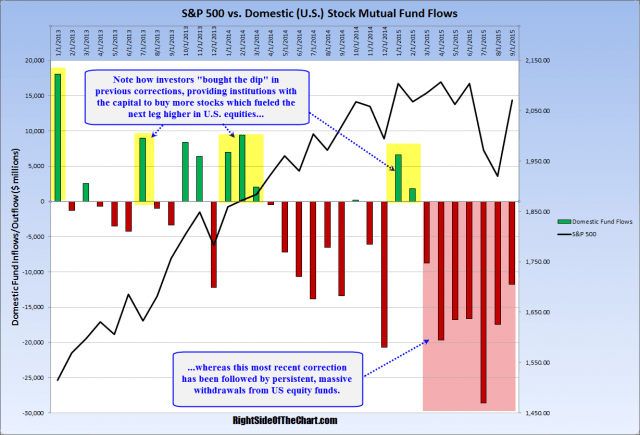 Although we don’t have the data for the October month end yet, the first two weekly reporting periods (Oct 7th & Oct 14th) for Domestic Equity Funds have seen net outflows of -$1.31 & -$1.44 billion, respectively, for a total of roughly $2.8 billion in net outflows MTD (data for the week ending Oct 21st should be released in the next day or two). Note how investors “bought the dip” in previous corrections, providing institutions with the capital to buy more stocks which fueled the next leg higher in U.S. equities whereas this most recent correction has been followed by persistent, massive withdrawals from US equity funds. DAVE: Good Food, Great Chart. 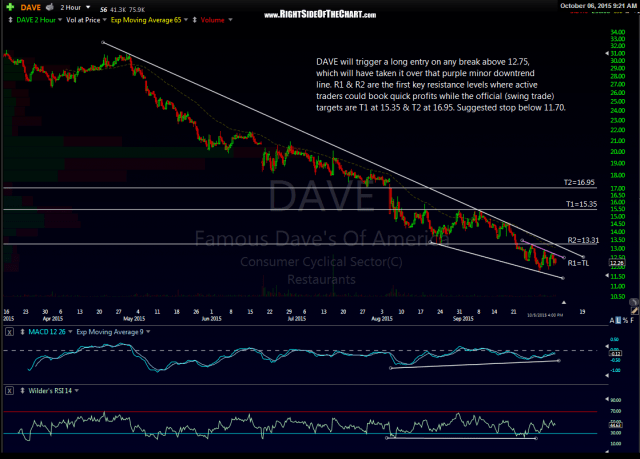 DAVE (Famous Dave’s of America) looks to offer an objective long entry on any break above 12.75, which will have taken the stock over that purple minor downtrend line on this 120-minute period chart. R1 & R2 are the first key resistance levels where active traders might opt to book quick profits while the official (swing trade) targets for this trade are T1 at 15.35 & T2 at 16.95. Suggested stop on a daily close below 11.70.